Last week I was on Trip Advisor answering questions about Belize, and someone requested help finding a map of the jungle lodges in Belize. This is something I have always wanted also. There are over 70 jungle lodges in the country, and many of them don’t have a map of their lodge on their own website, so it’s hard to figure out how far they are from town, which road they are on, etc. With this request, I realized that SOMEONE needed to make a map like this, and I knew who to ask: Marty Casado of AmbergrisCaye.com. Marty has the best Belize map page of any I have seen. He has maps of the country, maps of Belize geology, maps of Belize cities and towns, maps of the Caribbean, it goes on and on. If you are looking for a map of Belize, Marty probably has it. But guess what, he didn’t have a map of Belize jungle lodges. Once I asked him about it, he went to work, he stayed up until 2 am working on it! 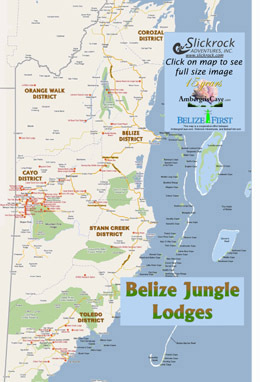 He started with our detailed Belize map, and a definite list of Belize jungle lodges from Lan Sluder of BelizeFirst.com and 5 days later, voila’, there was our map! Way to go Marty!